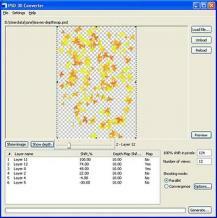 PSD 3D Converter is a powerful application that lets you convert a 2D PSD file to a 3D one in a simple manner. You can choose to have the output result in parallel shooting mode or convergence, plus you can have the app automatically calculate parallax and field of view to tweak the quality. You can view elements from the loaded PSD in a list, as well as several parameters which you can edit. Moreover, PSD 3D Converter lets you rescale, rotate and set the depth map parallax percentage for each layer. Finally, you can get the output result using the Generate option and save it as a multi-layered PSD file or a TIFF file. A reliable image conversion tool with numerous options such as effects, adding watermarks and more!